Japan has never been crazy about the Xbox 360, save for the few instances when it had exclusive role-playing games folks wanted to play. But generally speaking, it's been an uphill battle. That being said, Halo 3 did okay! For a first-person shooter. On the Xbox 360. In Japan. 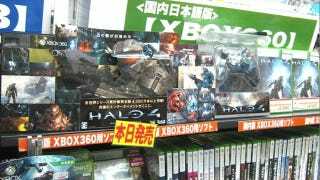 Earlier this week, Halo 4 launched in Japan. And, it seems to have gone pretty much like you would think: Japanese gamers who are into Western games (they exist!) and who own the Xbox 360 (ditto!) bought it. The rub is that there aren't huge numbers of either. But, like I said, Halo 3 did okay, everything considered. So maybe Halo 4 will too—again, taking everything into account. A telling contrast can be found in the above picture, which was taken on the night of November 8. Next to the copies of Halo 4, there's a small sign that says that the 3DS game Animal Crossing, which launched on November 8, was sold out.